It’s tempting to try to cram all regency romances into a single box. 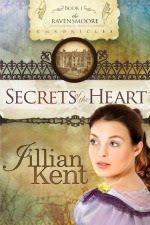 But Jillian Kent’s Secrets of the Heart isn’t concerned with the typical backdrop of balls and arranged marriages. Madeline Whittington has suffered a series of losses that have made her withdraw from society and although her official mourning period is over, she’s having a difficult time delving back into the frivolous round of fashion and fetes. The new Earl of Ravensmoore, Devlin Grayson, knows all about hanging on the fringes of society. As a younger son he had looked forward to a career as a physician. Then both his father and brothers passed away and the earldom devolved to him. Faced with a decision he chose to scandalize society by continuing to train for the profession he loved. The two serious outsiders seem made for one another, but Madeline blames Devlin for her beloved father’s death. He was there and Madeline is certain that if he hadn’t botched the care, her father would still be alive and the odious Lord Vale would not be courting her mother. Toss in a mysterious woman who won’t speak, a creepy lunatic asylum, and the labyrinthine mind of a dangerous opponent and you have a story that draws more from Jane Eyre than Jane Austin. You can find Secrets of the Heart in stores like Lifeway and Barnes & Noble as well as online here. I'm Jillian Kent. I'm more than enthusiastic about the release of my first book, Secrets of the Heart, The Ravensmoore Chronicles, Book One. I've been writing for years and now the dream is coming true. I'm also a full-time counselor for nursing students and have a masters degree in social work. I'm fascinated with human behavior and how our minds work. Because I work in contemporary society I thought it would be fun and interesting to explore what might have happened in a lunatic asylum in Regency England and that's just a snippet of how my story idea was conceived. I hope you will escape into the past with me and find faith for the future. I think you'll enjoy the journey. I’m revising my second book in The Ravensmoore Chronicles, Chameleon. You can read the first chapter of Chameleon at the end of Secrets of the Heart, but be warned I’ve now revised chapter one of Chameleon and it won’t be the same. It will be even better! J I’m also writing Book Three, Mystery of the Heart and trying to get the word out about Secrets. Lady Victoria Grayson travels to London for the first time in her adult life after surviving a chronic illness that kept her homebound as a child . Now she has been invited by her elder brother, Devlin, Lord Ravensmoore, to join him in London and catch up on some of the things she has missed during her growing up years. Snoop, as she is fondly referred to by her brother, is pulled into a hornet's nest of intrigue soon after she arrives. Her brother has been summoned by the Prince Regent along with Jonathon Denning, Lord Witt, who trained and led a group of spies during the war, to help ferret out the identity of the individual attacking members of Parliament. This is Lisa again: You all know my penchant for spies so I can’t wait until Chameleon comes out! You can find out more about Jilly and her upcoming releases here. Hi there all you inkies. Deb, I bet you can't believe I beat you to the morning post. It's about 3:00am and I just got back from making a run to the ER with my 86 year old mother. She's fine (thank you, Jesus) but it's been a long night. I am not a morning person to begin with so I thought I better drop in now because as soon as my head hits the pillow I probably won't wake up till noon or later. Lisa, thank you so much for this wonderful review. I really appreciate it. You all know how it feels to put everything you've got into a book, you want everyone to love it! :) I spent so many years on this baby, but God is good and I truly feel like it's made its appearance into the world at just the right time. I will drop in later to say hi again to all of you and answer any questions, but that won't be till this afternoon. Thanks for having me back. Wish I could keep up with everyone better but life is full. Yes, but I'd glad to have slept until 5:30 with a houseful of guests and dogs. The dogs are anxious to get the day started! I have this book and it's driving me crazy not to have gotten to it yet...but I will. Jill I MISS YOU! Super Congratulations on the success of SECRETS OF THE HEART, and many more blessings on your writing career! More Jane Eyre than Jane Austen, yay!!!! My kind of book. I plan to get to this one soon :) Love you, Jill. Jill, I'm so glad your baby has finally been released into the world. You must feel like a proud mama at a debut ball, and you certainly do have something to be proud of in this story! Hugs, and we're so glad you're back with us at the Inkwell today! Oooh, Jilly, I'm downloading this to my nook right this minute. I can't wait to read it. I'm so happy for you, but I miss you terribly. Suzie and Gina, I think you'll both enjoy it! I'm awake! :)Thank you all so much for the kind words. It means a lot to me coming from all of you. And I do miss you all tons. I have to admit though that it's so hard just keeping up with my own blog (every Tuesday) and the Realms blog at http://justthewritecharisma.blogspot.com/ If you haven't visited that blog I encourage you to do so. It's a lot of fun. Lisa you are spot on when you say my story draws more from Jane Eyre than Jane Austen. I'm excited to tell you (haven't said anything to anyone yet) that I've pulled together a team to address the issues of "The Well Writer" for the Online Christian Fiction Magazine. I kick off the fist article in the August addition. So keep an eye out. I just love seeing my book and Dina's book pop up in the "What We're Reading Widget." That's just too fun! And who is reading, Mr. Monk on the Couch? I'll have to get that! I know it won't be long till you are all selling. You're a wonderful group of talented writers and I'm so glad you're my friends. Ask me anything. I was privileged to win a copy of Secrets and absolutely loved it! Reminded me of the Victoria Holt books I devoured in the summers during junior high. Jillian, I look forward to the next installment! Hey, wouldn't that be something if our Jilly became synonymous with "the next Victoria Holt"? Doesn't that sound wonderful? I love the way you think. Niki, I'm so glad you liked the book. Yeah! Would you believe I never read a Victoria Holt book? Guess I better download one. :) Okay, so can you remember what your favorite one was? I know my aunt sent me several years and years ago, but I must have misplaced them in the jungle of books I have. Suzie I want your opinion when you have a chance to read Secrets. Jilly! So happy to see you here, and what a joy it is to celebrate your novel. I've got it here too and I can't wait to start reading it. Sorry to hear about your mom; hope all is well now. Thanks for the glowing recommendation, Lisa! Mom's doing fine. The BP was problematic but all is well. Thanks for helping me celebrate my novel. I want to know what you think when you get a chance to read it. Don't you think it's hard to get all the reading in you want to do when you write? Hugs!